Second post for today. My Pretty Pink Posh new product release blog hop is HERE! Today is Taylored Expressions sneak peek day #2. It is a Petite a Palooza this month. This month’s release goodies is perfect for the budget after Christmas. All this months stamp sets are smaller stamp sets and die combo with a few additional stand along dies and embossing folders. I love stamp and die combos. These sets has it all – images, sentiments and dies. 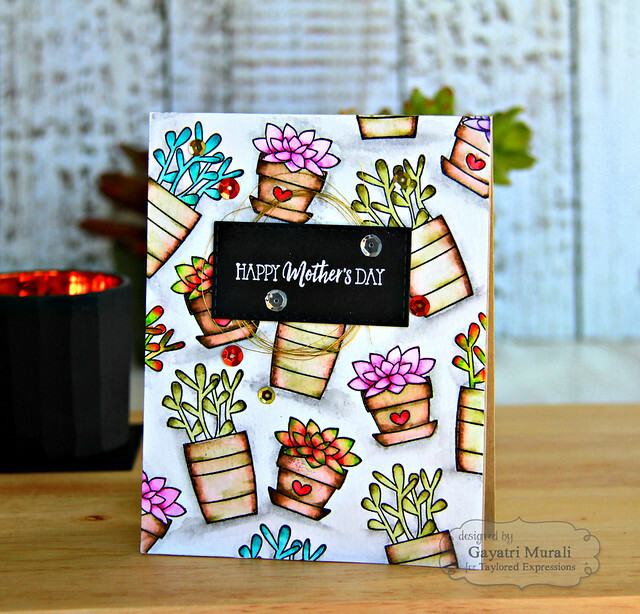 Today I am sharing with your one stamp and die combo called Simply Succulents. LOVE this set. 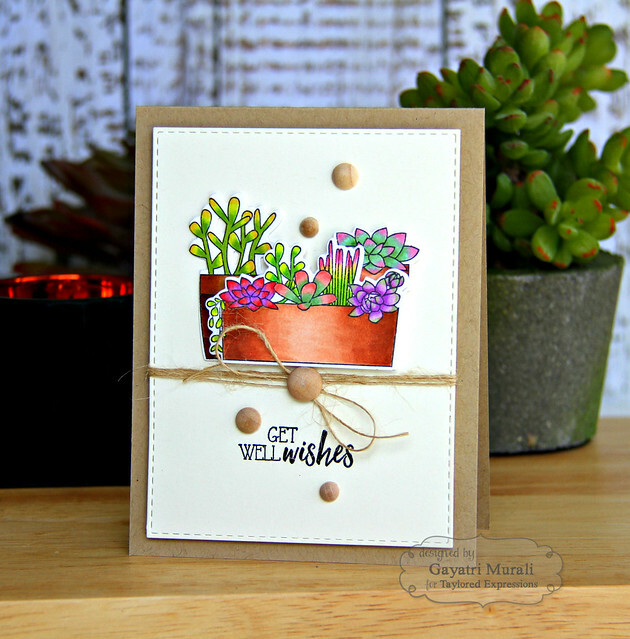 Succulents are trendy with cardmakers. Great variety of sentiments also in this set. This set is one of my favourite from the release. I have couple of cards to share with you using this stamp and die combo. On this card, I randomly stamped two of the succulent images from the set on distress watercolour paper by Tim Holtz using versafine onyx black ink and heat embossed using clear embossing powder. Then used Zig clean brush watercolour pens to colour the succulents and the posts. I also colour washed the background in grey with grounding the pots in place. I particularly love how the shading on my pots turned out. The sentiment is white heat embossed on a black stitched rectangle panel die cut using the smallest die from Stitched Rectangle Stacklets. I bunched up some gold thread behind the black panel and embellished with sequins from Rainbow Brights and Halloween collections. 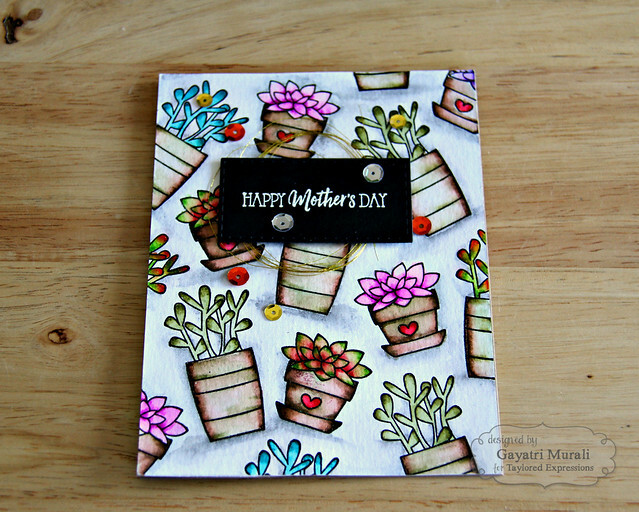 For the second cards, I stamped,copic coloured the succulents then die cut them using the coordinating dies from the stamp set. 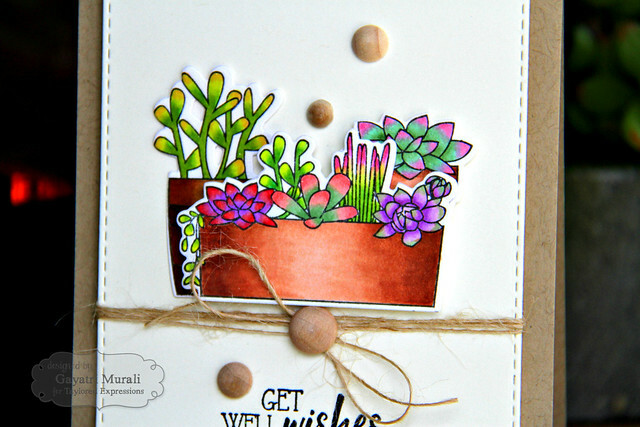 I wanted this card to be earthy and simply as this card is a get well card. I die cut the largest stitched panel using Butter Cream cardstock and Stitched Rectangle Stacklets die set. I clustered the coloured die cut succulents and adhered them on the center of the panel. Couple of die cuts were adhered flush and the rectangle large one using foam to give depth and dimension. I wrapped a jute twine and made a bow below the succulent cluster. Black heat embossed the sentiment below and embellished with woodgrain enamel dots from M Mind’s Eye. Finally adhered this panel on Toffee card base using foam adhesive. As always, I have listed all the products I have used to make both my cards below towards the end of my post. Love two different cards using the same stamp and die combo. Hope you do too. Taylored Expressions is celebrating release week with some fabulous giveaways! Visit the TE Blog each sneak peek day this week for details on how you can enter to win. Check out Taylored Expressions blog for more fabulous projects using the soon to be released new Petite a Palooza stamp and die combos. Your coloring is out of this world! Beautiful! gorgeous cards…esp love the first one. What great cards! Awesome release, love the new dies. Beautiful cards Gayatri. I love the colours you used on your first one. Very showy.